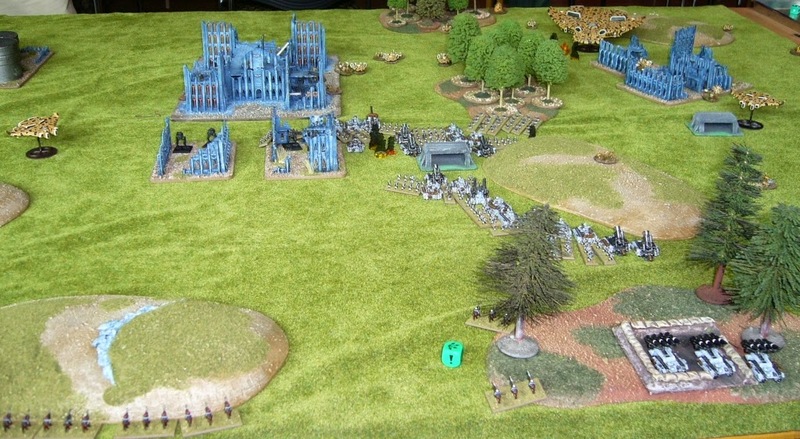 A couple of games were played at the local wargames club in the weekend. 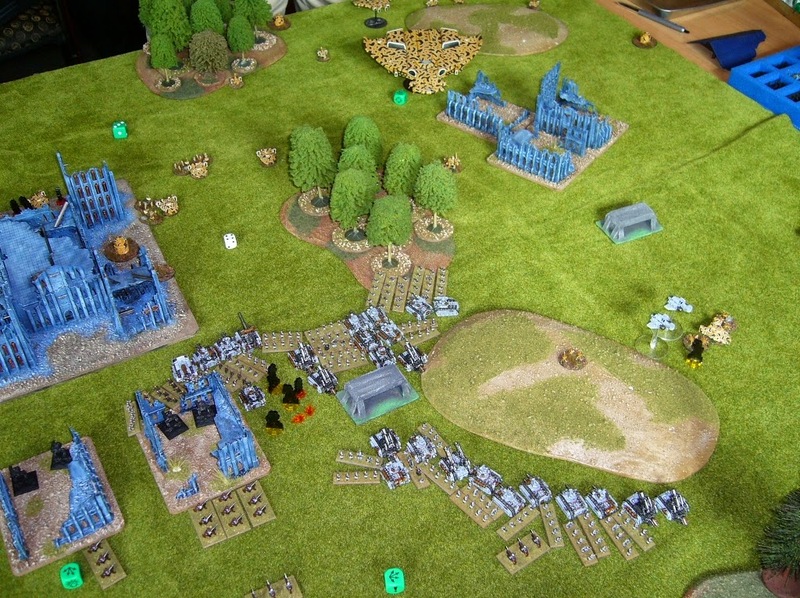 Here's the first between Glyn borrowing my Steel Legion, and Andrew using his mighty Tau. Andrew again contributed a great report. A few pictures were taken and I've added them as best I could to the narrative! An Imperial Mechanized Infantry force moved to block the Colonial Tau attempts to clear the Eastern Continent, Woolstonia, of the alien incursion. A space mobileKavaal [lit. Strike Group] was deployed to intercept them. The newly available Moray support craft were attached to Tio’ve Eoro [lit. Group, To Guide] control for the duration of the battle. Orbital fire support and light fighter cover was provided by other Kor’elan elements. Initial reports of a unit of Storm Troopers in Valkyries did not appear on the field of battle. Objectives were concentrated on the southern part of the battlefield with mutual lines of supply [blitz] established in or beside woods. 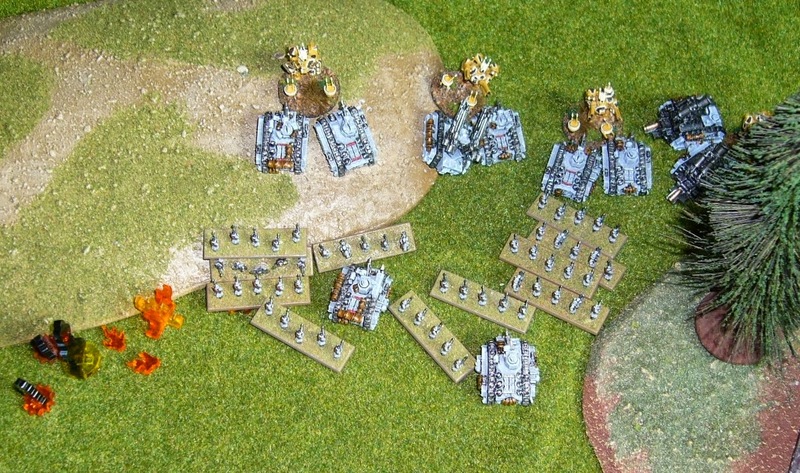 Guard bunkers [Tau T&H] were placed directly forward to protect the line of supply. 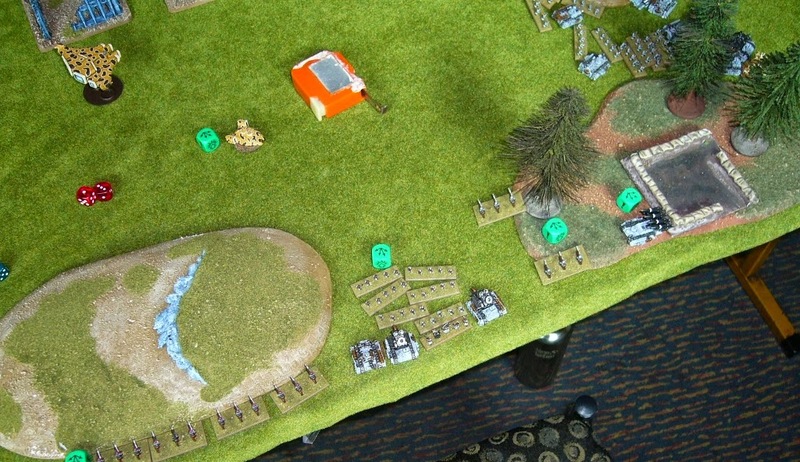 Tau gun towers [Guard T&H, Tau DtF] were placed to cover flank approaches to the rear areas. Guard forces deployed Rough Riders and Sentinels in forward screening positions. The rest of the army deployed in a compact band centred on the southern supply line. 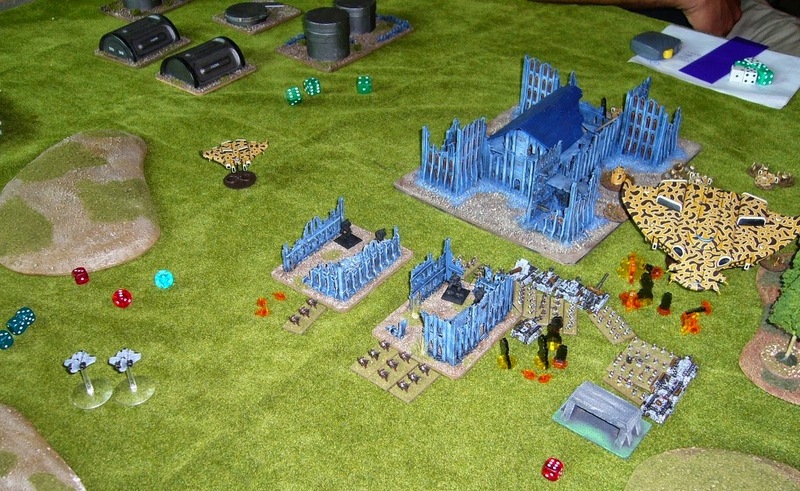 Tau Pathfinders were deployed forward, in over-watch positions. The Tetra/Piranha recon groups were deployed on the flanks in reserve positions directly supporting the two Moray Support Craft. The Crisis and FW Cadres remained aboard the centrally positioned Manta to protect them from Guard artillery fire and to provide an early heavy coordinated fire mission. The orbital re-deployment of the Tau Colonial Kavaal allowed the Gue’la [lit. Lowest Beings, i.e., Imperial Humans] sufficient time to ambush the Manta before it could engage [Glyn, Imperial won the Strategy Roll]. The Imperial Super-Heavy Tank Company appeared over the crest of the hill and scored four [TK(4)] hits on the Manta. The deflector screens performed valiantly reducing the damage but were knocked off-line by a critical hit. A follow up barrage by the Manticores punched a further hole in the fuselage [5 hits on the DC8 war-engine, no deflector screen, 7 Blast Markers, and no activations from the Tau yet, . . .]. The Manta advanced [doubled] through the storm of fire to directly retaliate. Ion Cannon and Guided Missile fire caused a critical explosion on the lead Shadowsword, and the Heavy Railcannon fire destroyed a second tank outright. The FW Cadre which dismounted into supporting positions behind the Manta helped thicken the Guided Missile fire. The Crisis Suits deployed to add their missile fire but re-boarded using their jet-packs [Tau Jet-Pack move]. 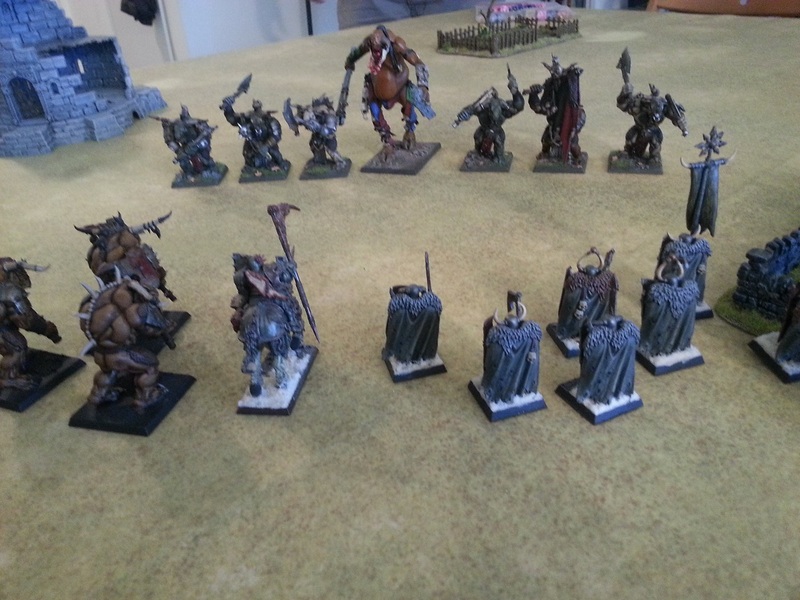 [Commentary: I wanted to move the Fearless FW unit forward to deploy them holding/contesting T&H objectives. Having them in the Manta protected them from early long range artillery fire. The only way I’ve managed to get value from Crisis Suits is in combination with the heavy battle taxi aspect of the Manta. I’ll keep trying other methods, . . . After taking the initial firestorm from the Shadowswords I could not combine a Marshall move with getting the troops out and firing. There was too much in the Manta to leave it there (doing nothing rather than in danger of being destroyed) and getting out and not firing with the three formations (if Marshall with a move) seemed too weak in the face of Glyn’s two opening activations. Was having them all in the Manta a mistake?? I definitely thought so at the time. Probably still do. I will try it again, . . . , well, yes!!??]. The battle intensified in a narrow corridor between the two supply lines as the Imperial Guard moved Mechanized Infantry Companies up into close range of the ailing Manta. Phenomenally accurate sniper fire killed the supreme commander early in the process [Guard re-roll already used for that turn]. Moving through the forest disabled one Hydra and missile fire accounted for a second during the Imperial approach moves. Concern over an engage move by the Rough Rider platoons with supporting fire from two full Mechanized Infantry Companies shaped the usual courageous actions by the Pathfinder Groups, Tau’va [lit. for the Greater Good]. Moving forward into flanking positions to support these troops, attain crossfire and to provide AA fire on the Thunderbolt exit flight paths brought the Morays unexpectedly close to enemy forces [only need to get within 60 cm to shoot at ground forces]. The light rail guns on these units were surprisingly defective throughout the battle [in all three turns only two hits achieved, despite markerlights and MW3+] but the overall destructive effect was a satisfying reflection on Kor’vre marksmanship. The orbital support from the heavy rail guns of the Protector destroyed the final Shadowsword and accounted for its accompanying infantry [BTS to the Tau]. A final long range volley from the Imperial Guard’s right flank Mechanized Infantry Company, as it doubled into a central firing position, caused the Manta to retire. The Shas’o disembarked during this move to take up positions to support the advanced formations on the Tau left flank. The Manta recovered control of its on-board systems [rallied in the end phase, Init 1+, broken -2, with an unused re-roll, not needed]. The broken Imperial formations failed to rally. With the initiative moving towards the Tau [won the strategy roll] the Manta and right flank Moray took advantage of crossfire opportunities to further degrade the Infantry companies. Enemy fire broke the right flank pathfinder group and the remaining Devilfish advanced [broke and retreated forward!] to constrict Imperial retreat lines, Tau’va. The Ethereal’s FW Cadre moved forward into pulse carbine range, occupying the ruined cathedral complex, and breaking another enemy company. The Shas’o doubled forward to ensure the crisis suit fusion blaster weapons had the range to hit the rapidly reloading Manticores. The Imperial Navy Thunderbolts continued to harass the Tau forward scouting elements. Both formations, now down to 3 aircraft, managed to return for follow up strikes and eventually broke the southern Pathfinder Group [activation rolls of 6 and 5, just making it in each case]. The pathfinders retreated to cover objectives on that flank. Suppression of the only remaining Imperial AA [7 BMs on the formation] allowed the Barracuda Flight to close on the tails of the Thunderbolts but again none were shot down in the dogfight; clearly elite Imperial navy units. The far right, northern, Imperial company rallied but otherwise the loss of the supreme commander continued to hamper the Guard formations [4 broken formations remaining]. The remaining Pathfinder Group rallied on the southern objectives. 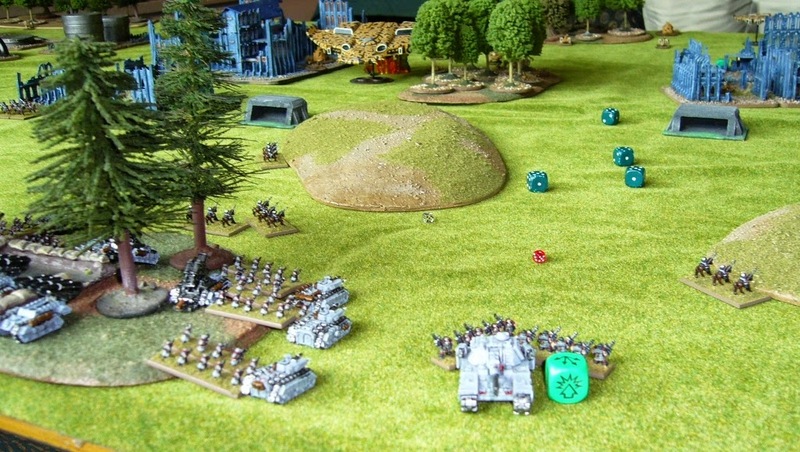 Despite the increasing disintegration of the Imperial Guard command and communications structure individual initiative from Company commanders saw Mechanized Infantry formations launch successful local counter-attacks. On the northern flank one company broke the Moray which re-grouped forward towards the Imperial Blitz [being fearless and only having taken one hit]. The remaining company close assaulted the crisis suits and cut them down. Once again the Colony salutes the sacrifice of our Battle Suit leaders, Tau’va. 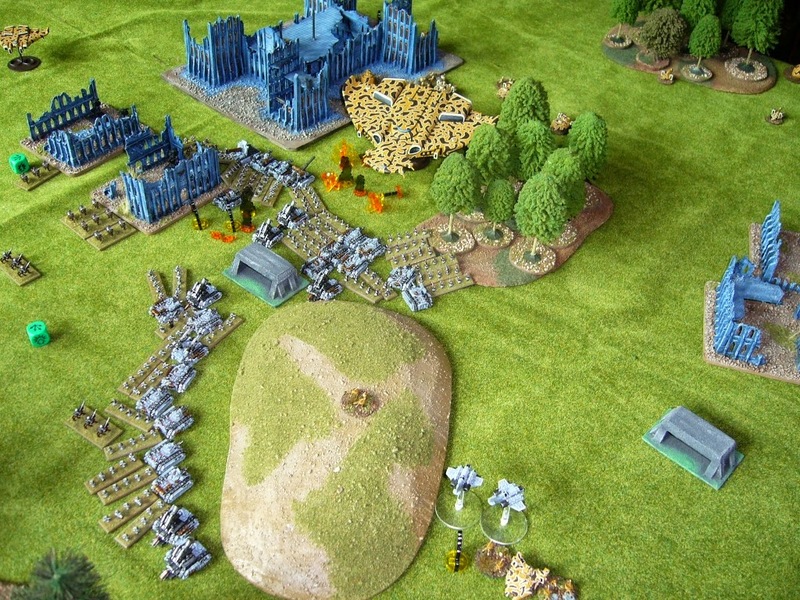 The FW Cadre continued its move to secure the northern defense tower [Defend the Flag Objective] and, again at pulse carbine range, wiped out the Sentinels in the ruins to the west of the cathedral complex. At this stage the senior surviving Imperial commander ordered wholesale retreat. With the Manta, a Moray and several supporting Tau formations still poised to move forward the decision was acknowledged with Honour [BTS, T&H, DtF, TSNP, and likely to take the Blitz]. Yes almost Francesc, thanks for the comment! Yes though they take a skilled player I think, which Andrew has certainly become! Cheers.